The "spot improvement" on westbound I-66 between the George Mason Drive and Sycamore Street is underway. These spot improvements, which are essentially short-distance widenings have been the subject of great debate for more than a decade. 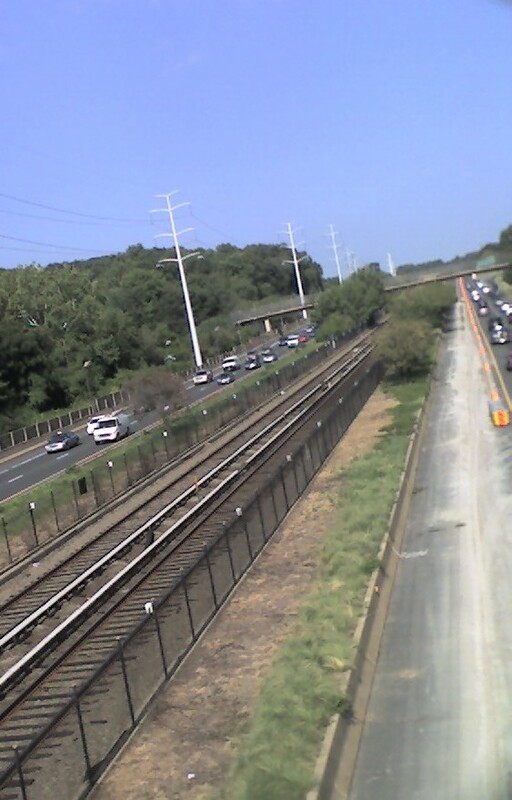 VDOT has long wanted to widen I-66 to three lanes in each direction; Arlington, smart growth and environmental groups have been strongly opposed. The original agreement to build I-66 included an agreement to not widen the highway beyond two lanes in each direction. VDOT has instead proposed a series of "spot improvements," which widen sections of I-66 to three lanes. This section is called "Spot 1," and it has a page on the VDOT web site. In February of 2009, the National Capital Region Transportation Planning Board voted to put these projects on hold,only to reverse itself the very next month. Since then, there has been little to stop this project from moving forward, particularly because it has received earmarked funding from Congress that can be used for nothing else. I-66 looking westbound from Ohio St. This one shows I-66 looking westbound from Ohio Street. Note the (semi) vegetated median between the left shoulder and the Metrorail tracks. That is being partially removed to make room for the additional roadway width. 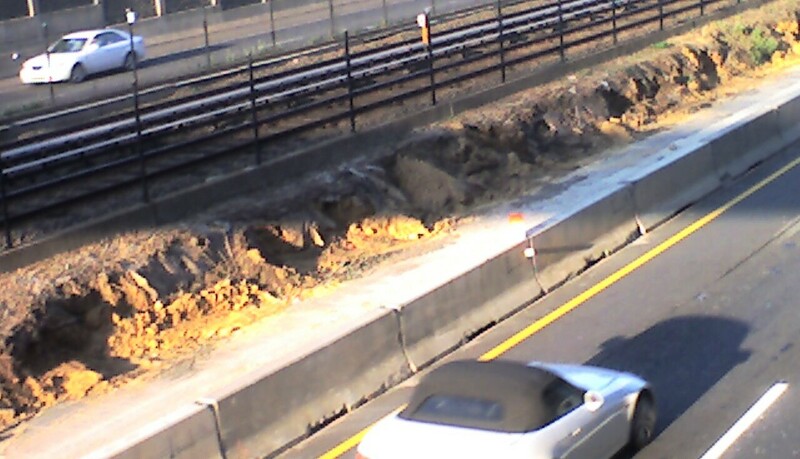 The photo at the top of the post shows the demolition of the median next to the Metrorail tracks. 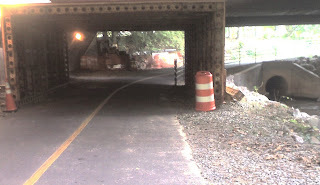 The Custis Trail passes under I-66 along this stretch of highway. At the point were it crosses underneath there are three bridges: one for each direction of traffic and one for the Metrorail tracks. The westbound bridge is being widened. To accommodate pedestrian and bicycle traffic during construction, VDOT has constructed this structure for protection. There have been occasional detours while work is being done here. The detour is well marked and only slightly longer. Once the bridge is widened, there will be less daylight at this point. Although there is some relatively inadequate lighting now, it may need to be upgraded as part of the improvements. - Support the economic vitality of the metropolitan area, especially by enabling global competitiveness, productivity, and efficiency. - Increase the safety of the transportation system for all motorized and non-motorized users. - Increase the ability of the transportation system to support homeland security and to safeguard the personal security of all motorized and non-motorized users. - Increase accessibility and mobility of people and freight. - Promote efficient system management and operation. Existing levels of congestion is exacerbated by the intense weaving and merging movements happening over a short distance along with inadequate sight distance. The recurring congestion and associated operational/safety effects poses concerns on the corridor’s ability to serve as an efficient emergency evacuation route. The suggestion that this will improve the road as an emergency evacuation route is just silly. The capacity of I-66 for evacuation will not be increased by adding a lane for a mile and a half. This language is likely a holdover from the arguments used for widening the entire length of I-66 inside the Beltway. Many people believe that once the "spot improvements" are all in place, the argument to widen the relatively short remaining sections will grow very strong, and VDOT will eventually prevail. It will be interesting to see how long that takes.